[G guardian] (Usable when both fighters’ vanguards are grade 3 or greater, and the number of face up G guardians in your G zone is three or less)-Opponent Turn’s Guard Step-[Choose a card with “Heal” from your hand, and discard it] Call this card to your (GC) from face down. 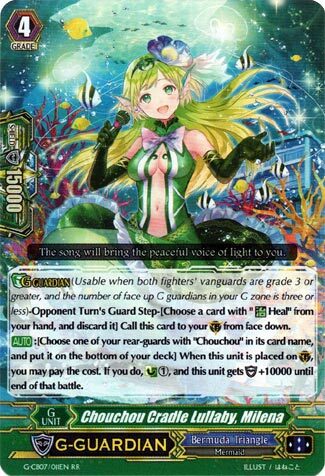 [AUTO]:[Choose one of your rear-guards with “Chouchou” in its card name, and put it on the bottom of your deck] When this unit is placed on (GC), you may pay the cost. If you do, Counter Charge (1), and this unit gets [Shield]+10000 until end of that battle. …It’s not great, I’ll be honest. Chouchou struggles to plus as it is and we don’t really need this adding onto our woes. Not even the Countercharge attached to it makes this G Guardian very attractive: it’s SOUL that Chouchou starves for the most typically. You have meatier shields for less requirements. Run those instead unless you REALLY have nothing better. Except you totally do. What’s up, Rogue Squad?! We’re wrapping this up with the newest Chouchou G Guardian, Milena. On paper, this doesn’t look too bad, a Countercharge and a 10k shield boost, but the problem is that it costs you one of your rear-guards, which is something that Chouchou can’t really afford to sacrifice. Not to mention that Bermudas already have so many better G Guardians to work with, so using Milena would be pointless. The G Zone only has so much space, and none of it has room for something like this.